The receiver kit (above) outputs I-Q audio that needs a PC with stereo input soundcard to demodulate. An external stereo input USB soundcard could be used but they can be expensive. So this is an optional plug-in kit that complements the new receiver module kit. It can be used to demodulate SSB (cancel the unwanted sideband) when your soundcard is mono input (many laptops and some PCs have mono input soundcards). 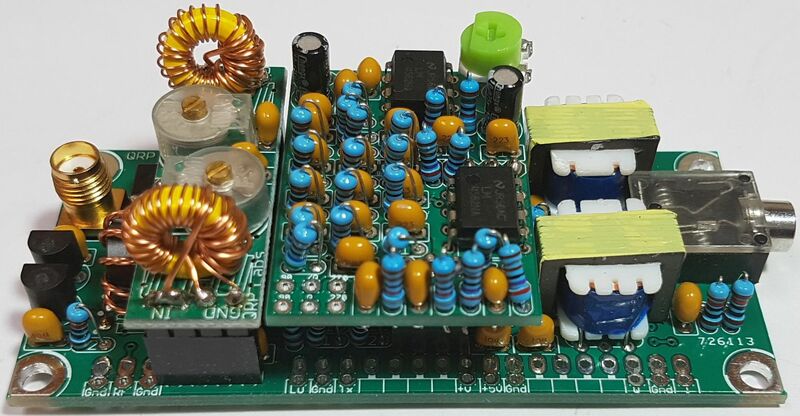 Alternatively you may wish to construct a standalone receiver project of your own - then this polyphase network can be used to drive an audio amp, for example. LSB or USB demodulation is selectable. See http://qrp-labs.com/polyphase for more details. This photograph shows the polyphase network board plugged into the receiver module board, and a 30m BPF also plugged into the receiver board. See http://qrp-labs.com/dummy . A nice shack accessory for testing QRP transmitters etc. 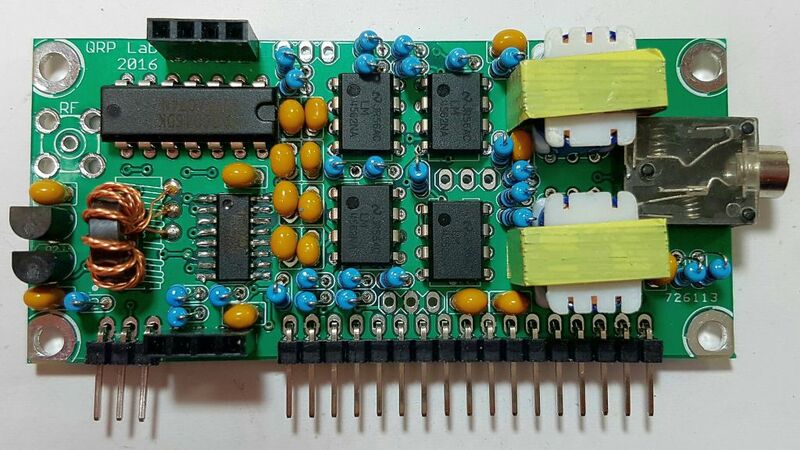 This dummy load kit contains two identical PCBs, and 20x 1K 1W resistors which are sandwiched between the PCBs. It has a BNC output connector. The kit also includes a simple RF detector. You can connect a DVM to the detector to get some idea of power output. An example calibration curve is provided. Dave was on holiday at the time but didn't let that stop his ballooning activities! In fact some of the balloons were launched at sunrise from a boat on the lake! This is a new twist to the balloon story! The boat was steered at a direction and speed to match the wind, so that balloon launching was (theoretically) easier. The Stella1 balloon was launched from Germany by Daniel DL6OW (and friends) on 30th July, with an Ultimate3S transmitter on board. It flew for 7 hours, reaching 8700m altitude and covering 181km. The flight was short due to a balloon burst. Nevertheless it was a great first flight by DL6OW and I am sure we will see more from Daniel and his friends in the near future! See http://www.qrp-labs.com/flights/stella1.html for more details. Daniel is the guy in the middle of this team photo! Every summer, Randy hosts a STEM (Science Technology Engineering and Mathematics) summer camp for all 6 of his Grandchildren. They have a construction project and also some DEstruction projects where various electronic things are educationally dismantled. This summer, Randy decided that the construction project would be the QRP Labs Clock kit http://qrp-labs.com/clockkit! So, six Grandchildren built six clock kits. The clock kit is supplied with a 16 x 2 LCD as the display, but is also compatible with other LCDs using the standard Hitachi display chip. So the projects used a 4-line display so that they could display additional information such as from the GPS receiver. The clock kit allows flexible configuration of the information on the display. What a great idea! Here are some photographs of the summer camp activities!